Can the Ayurvedic Herbal Medicine Mimosa Pudica Stimulate Nerve Regeneration in Spinal Cord Injury? Although it may be considered a new alternative medicine in America, Ayurveda, as the world’s oldest known health-care system, is the “granddaddy” of healing traditions. Developed over centuries of use, it is a mind, body, and spirit approach to healing that attempts to keep people healthy and disease-free. Ayurveda’s focus is the prevention of disease, including the sort of chronic health problems that frequently afflict individuals with physical disabilities, including spinal cord injury (SCI), and multiple sclerosis (MS). Ayurveda originated in ancient India over 5,000 years ago. In spite - or perhaps because - of these ancient roots, its influence in today’s world may be greater than people think. For example, according to legend, Buddha, a great admirer of Ayurveda, sent teachers to different countries to integrate Ayurvedic perspectives into local healing traditions. These traditions, in turn, became the foundation for many of today’s approaches to medicine. Ayurveda survived various threats over the millennia because it was deeply ingrained within Indian family customs and culture. These threats, in part, resulted from foreign conquests of India by Muslim nations and later the British, who imposed their medical standards (i.e., conventional medicine) on Indian society. After Indian independence in 1947, Ayurvedic medicine began to resurface in popularity. The Maharishi Mahesh Yogi, Transcendental Meditation Program founder, facilitated its introduction into western society. Ayurveda’s visibility soared after the popular author Deepak Chopra began publishing best-sellers on the subject. In Sanskrit, the ancient language of India, Ayurveda means the “science of life and longevity.” It attempts to make sense out of life through living in harmony with nature. Because of its ancient origins, Ayurveda is explained with concepts and terminology developed without the benefit of modern anatomical and physiological insights. People steeped in 20th- century medical thinking may view Ayurveda’s tradition-based theories as archaic with limited healthcare relevance in today’s world. Nevertheless, ancient wisdom often has much validity. Modern science is increasingly proving the effectiveness of many Ayurvedic therapies and approaches, and explaining how they work in scientific terms. According to Ayurvedic theory, all individuals are made up of three basic energies or doshas called vata, pitta, and kapha (see glossary) These are present in unique proportions defined at birth. Like a fingerprint, your characteristic mix, called prakruti, will distinguish you for life with respect to physical, mental, and emotional predispositions. It reflects your true, essential self. Although your prakruti may be set for life, your day–to-day mix of vata, pitta, and kapha may vary greatly depending how well you interact with your environment (e.g., stress, dietary choices, exercise patterns, and seasonal changes). Your current mix is called your vikruti. If your vikruti is identical to your prakruti (i.e., born-with Ayurvedic ideal), your health should be excellent. Simply stated, if you can remain true to who you are from an Ayurvedic perspective, you will be healthy; if you cannot, you will invite disease. Vata is the pranic life-force energy associated with physical and psychological movement, circulation and the nervous system. People predominately influenced by the vata dosha tend to have thin, light, flexible bodies and are characteristically quick, changeable, unpredictable, enthusiastic, and talkative. They often possess quick minds and are creative. When out of balance, vata individuals experience nervous-system disorders, energy or intestinal problems, insomnia, dry skin, and anxiety. The vata dosha is balanced by regular habits, quiet, attention to fluids, decreased sensitivity to stress, ample rest, warmth, steady nourishment, and oil message. Pitta energy governs metabolism. Pitta individuals are often of medium height and build; and tend to be fiery, intense, possess a sharp and creative mind, a penetrating look in their eyes, a ruddy complexion, a competitive streak, and a hot temper. When out of balance, they experience fevers, inflammatory disorders, heartburn, ulcers, skin rashes, anger, and irritation. Moderation, coolness, leisure, exposure to natural beauty, and decreased stimulants balance the pitta dosha. Kapha energy governs the body’s structure and provides strength, vigor and stability. Kapha individuals usually have a strong, large, healthy, well-developed bodies that tend to gain weight. They are even-tempered and calm, and have impressive endurance. When out of balance, Kapha individuals are predisposed to respiratory and congestion disorders, sinus problems, obesity, tumors, and lethargy. The kapha dosha is balanced by regular exercise weight control, variety of experiences, warmth, dryness, and reduced sweetness. To maintain health, you must strive to adjust your vata, pitta and kapha mix to match your born-with Ayurvedic ideal. To do this balancing, you must know 1) your current mix of vata, pitta, and kapha (vikruti), reflecting your present state of health; and 2) your born-with Ayurvedic constitution (prakruti), reflecting what you wish to regain. In other words, you need to know where you stand now and what you are aiming for These assessments can be obtained using questionnaires included in many Ayurvedic reference books. Once you understand your doshic imbalance, you should take appropriate actions to help you realign your mix of vata, pitta, and kapha in the desired direction. For example, although you may have been born with a kapha constitution (prakruti), the stress of modern living and a fast-food diet has aggravated your vata dosha. As a result, you are now experiencing vata-associated disorders, such as anxiety, insomnia, or intestinal problems. To remedy this imbalance, you would take steps to reduce vata aggravation and promote kapha expression. In Ayurveda, these steps emphasize diet and nutrition, exercise, rest and relaxation, meditation, breathing exercises, medicinal herbs, and rejuvenation and detoxification programs. Modern science is increasingly recognizing the benefits of many of these lifestyle factors. For example, meditators visit doctors half as much; have lower rates of cancer, heart disease, and substance abuse; and age more slowly. In Western medicine, the five senses have little therapeutic role. For example, if you are given a drug, its taste or smell isn’t important. However, in Ayurvedic medicine, the senses play a key role because they are considered doorways to your internal physiology. 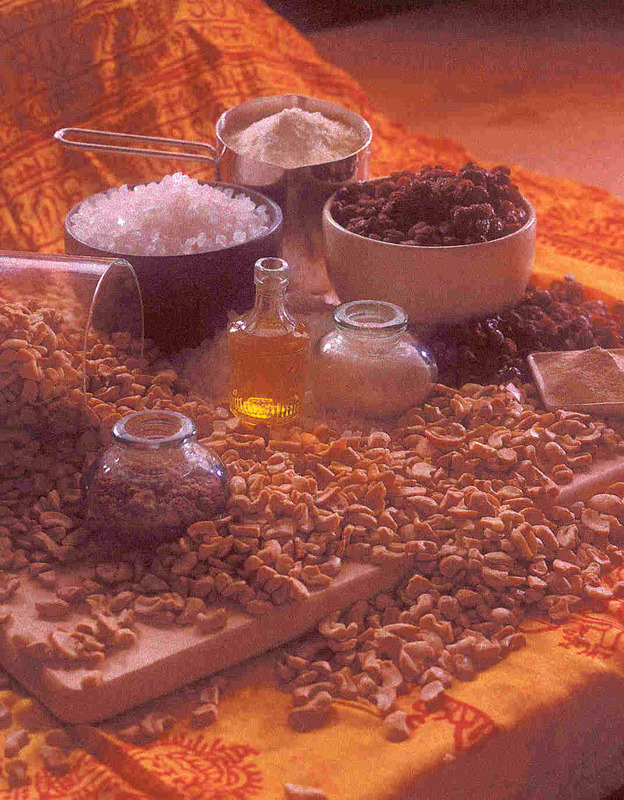 As such, Ayurvedic therapies frequently attempt to evoke various sensory combinations. With this view, food and spices will trigger physiological responses not only through its nutrient value but also through taste and smell. Thus, with Ayurveda, the whole is greater than the sum of the parts. For example, acquiring your vitamin C through freshly squeezed orange juice is more meaningful than a vitamin C supplement. In general, this approach reflects a major difference between Eastern holistic and Western reductionism medical philosophies. Where Western medicine would attempt to isolate and, in turn, market a plant’s physiologically active component, Ayurveda would use preparations of the whole plant. In addition to the active ingredient, Ayurveda believes that other synergistic components and sensory-provoking aspects of the plant are also important. In Ayurveda, digestion is the foundation of good health. The doshas produce a metab olic fire, called agni, that transforms nourishment from food, feelings, and thoughts into a form your body can use. If your digestive fire or agni isn’t working properly due to doshic imbalance, you will produce toxins, called ama. Ama will clog both your body’s physical (e.g., intestines, arteries, etc.) and nonphysical (e.g., energy) channels. To prevent ama accumulation, individuals should favor different types of foods depending upon whether they are more influenced by vata, pitta, or kapha doshas (see resources listed below for dietary recommendations). According to Ayurvedic theory, the American diet aggravates the vata dosha, which has resulted in many of the health problems that characterize American society. People with spinal cord dysfunction often have an increased incidence of chronic health problems. It is speculated that these problems stem from, or are aggravated by, the considerable physiological and metabolic shifts that occur in the body after paralysis. From an Ayurvedic perspective, these shifts increase the divergence between your vikruti (your current mix of vata, pitta, and kapha) and your prakruti (your born-with vata, pitta, kapha ideal). For example, spinal cord injury promotes a vata imbalance. If this is not corrected, ama (toxins) will accumulate, clogging your body’s channels and, in turn, causing disease. Hence, people with SCI need to be vigilant in their efforts to regain a good doshic balance, especially with respect to foods and behaviors. According to Dr. Rama Mishra, a leading Ayurvedic physician trained in India, certain spices are recommended for clearing channels of ama after any sort of injury. These include turmeric, black pepper, ginger, coriander, fennel, and licorish. He also notes that his company, Maharishi Ayur-Ved Products, headquartered in Colorado Springs, markets a multi-herbal product (only through health-care professionals) called “Regen – Nerve.” One of the herbs is derived from a plant called Mimosa pudica (common name: the “sensitive” or “touch-me-not” plant”). According to animal studies, this herb promotes neuronal health. Specifically, scientists have observed in rats with experimental injury of the sciatic nerve (which runs through the pelvis and upper leg), regeneration was 30-40% higher in the animals treated with the Mimosa pudica extract. Effect of Lajjawanti (Mimosa Pudica) on Regeneration of Nerve, G.C. Prasad, R.P. Khanna, V. Prakash, & K.N. Udupa, Jur. Res. Ind. Med.10: 4, 1975 pp.37-44. Summary: "Regeneration of peripheral nerve was studied in young growing albino rats. The sciatic nerve of each animal was crushed after help of artery forceps. They were divided in three groups containing equal number of animals and were treated either with total extract of Lajjawanti or hydrocortisone. The remaining third group were left as control. Animals were sacrificed at the intervals of 30, 60, 90 and 120 days. The process of regeneration was studied histologically, electrophysiologically, and the number of axons was also counted at each interval. The results of this experiment showed that the regeneration of the nerve was enhanced by30-40% in Lajjawanti treated animals..."
Although the possibilities were intriguing, Dr. Mishra did not know whether this herbal product could benefit those with spinal cord dysfunction. In an attempt to address this possibility, I carried out a small pilot study testing the Regen-Nerve product in paralyzed veterans. Twelve men and one woman with an average age of 52 were recruited, nine with SCI, two with MS, and one each with spinal meningitis, and spinal cerebellar degeneration. Although no major functional improvements were noted - as expected for a small pilot study of this nature with a limited treatment time – many subjects reported a variety of subtle effects (e.g., spasticity changes). Even with substances that have been demonstrated to restore some function, effects were often subtle and only proven with sufficient sample size and follow-up period. My "gut feeling" on this limited data is that some neurological effects are, indeed, accruing. Click here for a further discussion of Mimosa pudica's potential ability to rebuild nerves from an energetic, mind-body-spirit perspective. In conclusion, Ayurvedic medicine represents an ancient healthcare tradition that is becoming increasingly popular as an alternative medicine modality. Its emphasis on health maintenance through enhancing inherent healing ability has considerable relevance for many chronic health problems, including those that frequently afflict people with spinal cord injury and dysfunction. Helpful Resources: For further information on Ayurvedic medicine consult the following resources: 1) The Complete Book of Ayurvedic Home Remedies, by Vasant Lad, Three Rivers Press (1998); 2) Perfect Health: The Complete Mind/Body Guide, by Deepak Chopra, Harmony Books (1991), and 3) Ayurveda: The A-Z Guide to Healing Techniques from Ancient India, by Nancy Bruning & Helen Thomas, Dell Books (1997). Special thanks are extended to Dr. Rama Kent Mishra, Director Research, Maharishi Ayur-Ved Products (www.mapi.com & 800/461-9685), and Cary Valentine, Rocky Mountain Ayurvedic Health Retreat (800/247-9654). Adapted from article appearing in Paraplegia News, November and December, 2000 (For subscriptions, contact www.pn-magazine.com). Keep posted on new therapies, treatments, potential cures, and developments! AGNI: The digestive fire that provides energy for the body to function. AMA: Toxic impurities that remain after improper digestion, which is the root cause of many diseases. DOSHA: The three forces (vata, pitta, kapha) responsible for determining an individual’s constitution controlling the functions of mind and body. KAPHA: One of the three doshas; responsible for body structure. PITTA: One of the three doshas; responsible for digestion and metabolism. PRAKRUTI: Your inherent nature, as expressed by the proportion of the three doshas you were born with. VIKRUTI: Your current state; the ratio of the three doshas that fluctuates along with your health.